Advertise your propane business on AllPropaneMowers.com and drive qualified sales leads for propane autogas, propane powered equipment and fleet vehicle conversions your way. The average commercial lawn mower consumes at least 5 gallons of propane a day. 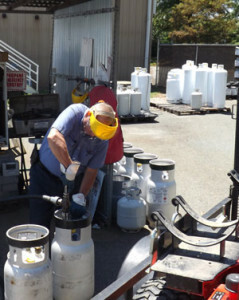 When you look at what a lawn care contractor spends on fuel every year, aside from the additional costs associated with ethanol damage to lawn & garden equipment and pilferage of gasoline, you can see why propane autogas is the solution to the problems that green industry fleets are facing. For less than what you may have spent for breakfast this morning, you could be tapping into a new market and adding significantly to your bottom line. Get on our map to reach your target market! The yellow map on the right side of each page page is one of the most frequented areas of AllPropaneMowers.com. Your company can be accessed in two clicks from anywhere on this website. When you join forces with us, your business will be represented in each of the 50 states where your company is located with a prominently displayed logo ad. Each logo ad will click through to one or more web pages on AllPropaneMowers.com that we design for your enterprise to highlight your products, services & expertise. All pages on our site are search engine optimized and are easily found on Google and other search engines. All of the web pages which we create for you will be branded for your company – no other advertisements will appear on your pages. Download the AllPropaneMowers Advertising Contract and return the completed form to us with your payment. Advertise with us. Get started for as little as a dollar per day! The Future of lawn care is here! Be a part of it and reap the benefits!